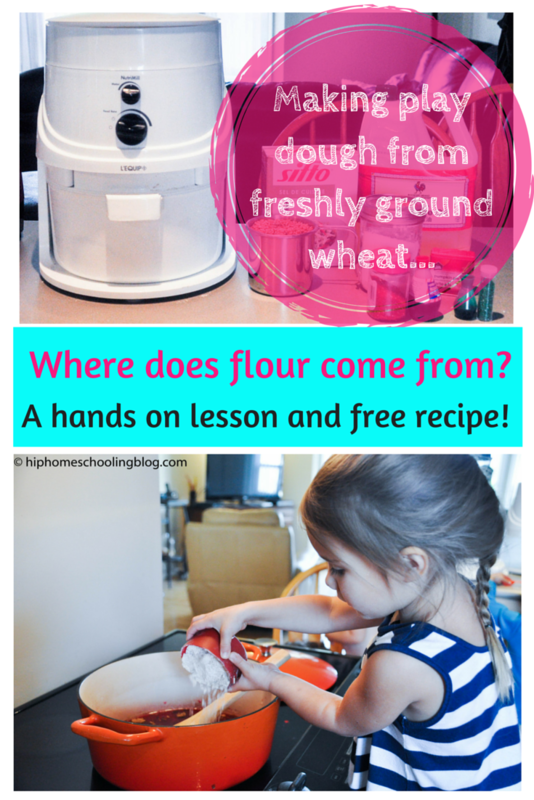 You are here: Home / Homeschooling / Making playdough from freshly ground wheat. A hands on lesson and free recipe! I woke up one lazy Saturday to the sun streaming in, new possibilities on the horizon… and kids glued to the television. I needed something more interesting than the TV, pronto! We haven’t played with playdough for so long, I knew it would be a hit! But I had no flour in the cupboard and had been putting it off for weeks. I have a grain mill and bags full of grain for homemade bread and I thought it was high time I came up with a recipe that would work. Take a minute and pin this image for later! If you have worked with freshly milled wheat you will know that it is much denser and stickier than white flour. It is completely different using it in recipes. It absorbs more water but it takes a while to see the effects. It also depends how finely you grind the flour and what kind of wheat berries you are using. 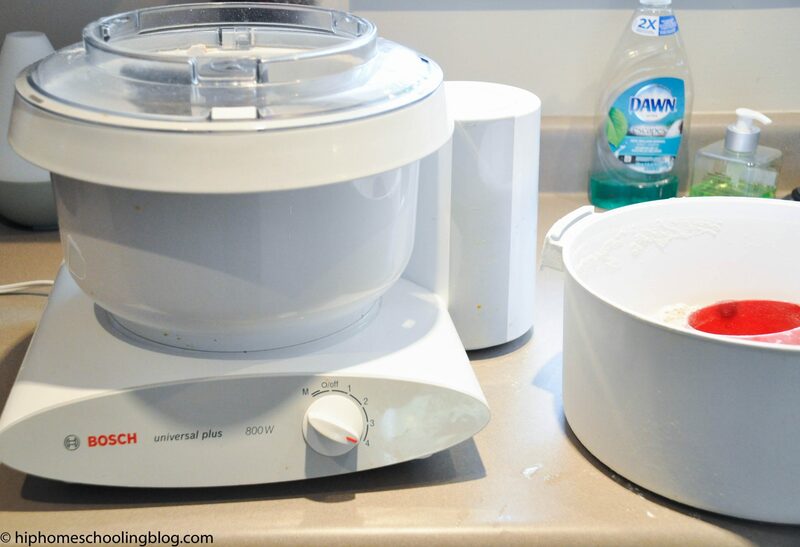 I used hard red wheat in my NutriMill on the fine flour setting in this recipe. 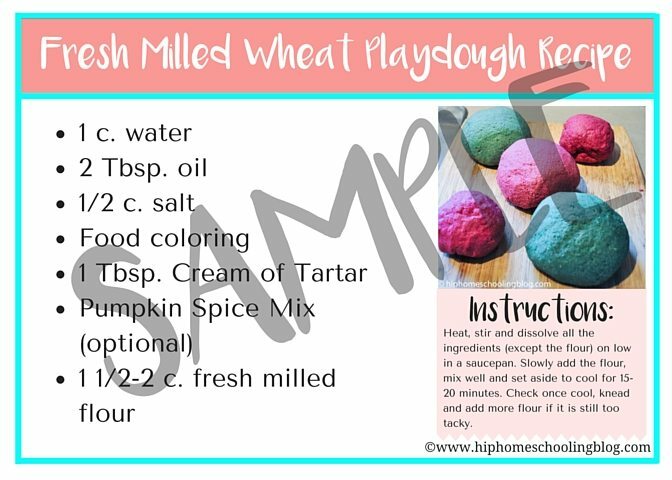 This is a cooked playdough recipe. The heat helps dissolve the salt and makes a smoother dough. Any large saucepan will do. If you are worried about putting food coloring into your pot, you can add it afterwards to the dough as you are kneading on a piece of parchment paper. I didn’t have any troubles in my pan but I don’t make any claims! Here is a sneak peak at the recipe card. It is 5×7 and can be printed on a recipe card or just used on your computer. Just enter your name and email below and you’ll have it in your email inbox within an hour (usually within a few minutes). Just make sure to add rebeccaspoonerpgblog@gmail.com to your contacts and double check your spam folder! Have your kids ever asked what is in bread? Or where flour comes from? I think it is so important to teach our kids not just how something is made in the kitchen, but how it is made from farm to table. Whether you have a mill or not, this is a lesson any child can and should learn! I started off showing them some Google images of wheat fields so they could see how it is grown in the fields. We then looked at the breakdown of a wheat berry before we turned on the mill. Check out this cool diagram we found here! Each cup of wheat berries makes about 1 1/2 cups of flour. We pulled out our notebooks and figured out how much we would need (um, hello math on the weekend!). 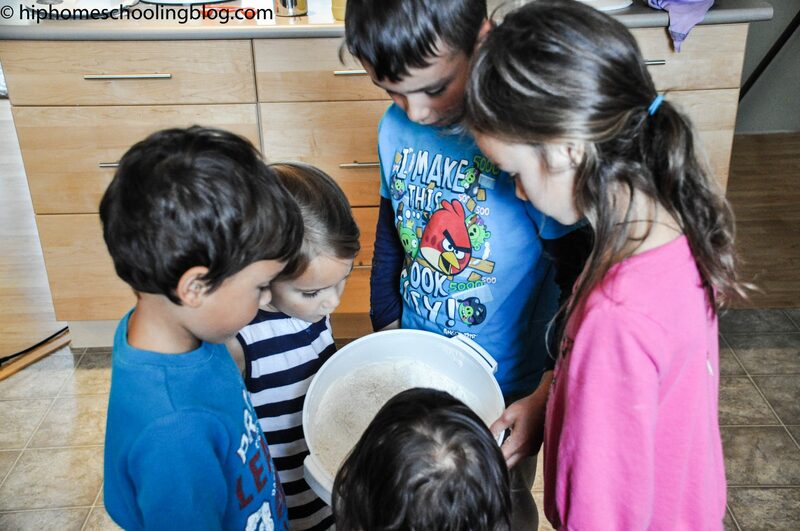 Once we had ground our flour, the kids couldn’t wait to feel how warm it was and what the texture was like! Of course making playdough for five kids is a long, laborous job. With all the kneading and stirring and mixing, I caved and pulled out my Bosch. This is the BEST investment I have made, especially when it comes to baking for my family. Kitchen Aid doesn’t hold a candle to this baby. It can handle my heavy, fresh-ground wheat, cookies, batters, anything I throw at it!